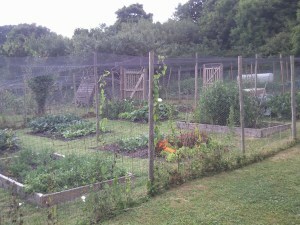 Welcome to the Ivinghoe Parish council’s allotment web page. Whether you are an existing tenant or possibly considering an allotment hopefully this page will answer most of your questions. The allotments are situated in Church Road, Ivinghoe; the entrance gate is opposite the churchyard. The site covers quite an area, not all of it worked. It is only in the last ten years with the sudden resurgence of interest in growing your own that the council with the help of grants cleared a large area which is now taken up by enthusiastic tenants. Any parishioner is entitled to visit the allotments. After visiting the cultivated sites there is a very attractive walk through the wild area that brings you out into the wild flower and picnic area with outstanding views across to the Beacon and Pitstone Hill. Please contact Ivinghoe Parish Clerk if interested in becoming a plot holder. We would also encourage you to read the Terms and Conditions for having an allotment plot so that you really know what you are taking on. For all the latest goings on at the allotments, read Ernie's articles in The Beacon magazine, published quarterly.